THE FOR RELEASE SEPT. 9, P.M.
S fed to livdtock is expected to be the lowest since 1941-42. -ie- d- r '-i--[ >--- . is 3.6 million less than the 1948 goal and6.2 million less than the 1948 seeded acreage. demand, will add to the building up of stocks which started last year. bring the loan level down 5 to 10 cents per bushel. available for wheat to other crops, including grass. harvested in 1948 is recommended for 1949, or a goal of 2.5 million acres. about 30 million bushels, compared with 26.7 million bushels in 1948.
record h_-h of 631 million bushels. much loss than that of some recent years when large quantities were fed. size would leave about 730 million bushels for exports and carry-over. 1932-41 average of 235 million bushels. particularly meat and other animal products. reported generally favorable in Argentina, except in Uorth Santa Fo. Acreage continues at a very low level. a large wheat acreage in 1Y-4 as an emergency measure. suited for crop production over a long period. dustrial use, 150 million for feed, and exports of about 325 million. quotas could be proclaimed even on the goal's acreage. cultural output in Europe and Asia and more normal production in . portant in determining the quantity of Unitod .Sttes exports. the result of above-average growing conditions. Seasonal decline to within 8 cents of loan level on July 7; CCC purchases heavy. I r-^- ~ -1 (MILLIONS. supplyi ms all, compared with demand, and prices in the United States rose considerably above parity. Since 191, both the supply and demand were very large. at which supplies will begin to allow for thr, rebuilding of stocks. at a time when production in Argentina and Australia mas below average. formula. The parity index next year is likely to be less than this year. parity index and reduce the loan level by 5 to 13 cents per bushel. 1920-21, and in the 3 years beginning with 1945-46.
net exports averaged 169 million bushcls. was the most important factor in domestic wheat prices. 730 million bushels for export nnd carry-over. avcrare of 235 million bushels. and the annual loan rate beginning with July 1937. .
committed for export in July-Septerber, rand actual exports are runrdng_ ..
of the leostern Honisphoro after August 27.
low on August 2, which at lansas City was about 13 cents under tho loan. exporting countries worc a record of 1,737 million bushels. By July 1945, however, they vero down to 18 million bushels. In 1940 they vwre 387 million and in 19-17 w~ro 385 million. Sssuie of May-ly 1948, table 5, page 14. I.JLU .L c. .. ... '. .
short supply, particularly moat and other animal products. in table cn pago 22.
up to Locc.nbcr when the new crop year b-igin in those countries. NorthJrn Hneisphcro iay be about 10 pcrcont above the siall 1347 production..
and tho Soviet Union, however, production is still woll below avera.go.th. rains helped fill the grain and offset earlier damago duo to drought. small 1947 harvest, though about 10 percent below the 1935-39 average. there aro good prospects in Europ. for potttous and other vegetables. cent compared with the 1C'47 harvest, and is only slightly below average. United Kingdom and France was reported to have caused some damage. lion bushels, compared with 495 million in 1947 and 763 million in 1035-39.
estim..ted for Poland and Germany, the largest producers of the area. larger than a year ago. vest of 28 million bushels. be 25 percent above average and in Turkey about 20 percent above average. tion, which is reported this year to be smaller than in 1947.
continues at a very lo-' level. 'building up more adequate reserves. about 14- percent more than the acreage indicated for harvest in 1948. -about 30 million bhshals, compared v.ith 26.7 million bushels in 1948.
ports have beea larger than exports in 10 or the past 15 years. they are expected to continue below 1C7-48 in the years irmodiatoly ahead. 75 conts bolow a year earlier (table on page 18). December 31, 1948. Loans mature April 30, 1949, or earlier on domand. on page 17 in The Wheat Situation, issue of May-July 1948.
relative to what begins on page 23.
pago 16, 1933-39, Laroh-April IE94', o go 18. S :C : C : : rop. 49.2 55,2 52,9 50.4 56.3 61.3 64.1 68.9 69,5 71.9. 79.7 .60. 88.6 4.5 101.0 102.0 107.0 111,0 111.0 111.0 112,0 111.0 105.0 98. 124,0 131.0 138,0 150.0 113.0 150.0 16-1.0 175.0 195.0 192.0 145.0 1355. 3./ Data 1908-1929 in Tho I~h~cat Sitult~ion, Sept.-dot. 1945, pago 14. .
fData feo figures on cov!_r gc)_ ..
lil. Hil. 'il. iil. Liil. l. 11li l1i 1il. !il. bu. bu. bu. bu. bu. bu. bu. bu. bu. bu. bushels, whichh is usud as 5ear-end carry-over in the 1936-37 marketing ytar. 5/ Lss thnn 50,000 buchcls. 2/ Supply preliminary, distribution tentative. The Wheat Situation, Mbroh-April 1943, pagee 10 an 11. 1/ Beginning July 9, 1947 sales of hard and dark hard winter combined. / Average of daily cash quotations. j/ F.O.B. spot or to arrive. / Fort William quotation is in store. 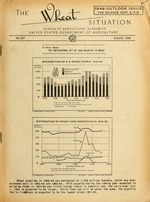 Data 1922-34 in Wheat Situation, August 1945, page 24. 2/ Includes Canadian wheat in the United States. acreage allotments for the 1?49-50 w,.ent production and mar!kting year. June 15 was 251. Parity was $t2.22, and 90 percent was 52.u0. supplements and modifies that Act in several important respects. changed from the 1933 Act.4/ Lhder that Act the national acreage allotiaer.t. rovers voting in *, referendum. 1~,-0-51, provided yields turn out to bu only .bout average. However,. th3s', products in recent years. seeded the fall of 1949 there may be some doubt as to whether the Act . applies to the crop hnrv3sted in 1950. .: ;. the products in the base period August 1909-July 1914.
in the most recent 10 years. 'farmers, including interest and taxes (251 percent of 1910-14). obtain a new parity price of $1.82 per bushel. June 15, 1948 (1910-14 100) ........................ 251.
from `$2.22 under the present formula to 01.82 undor the nre formula. ceived by farmers in that month. relationships of June this year. until the old parity price has been reduced to the new parity price. transitional parity price would be $2.11,instead of $1.82. t rices at as high as 90 percent of parity. the support price level becomes. 50 percent of the parity price. There is one further qualification to the new price support structure. in which the supply percentages indicate that quotas could be proclaimed. cent of tne support price. if imports jeopardize the effectiveness of price support operations. support operations. This provision becomes effective January 1, 1950.
maximum of 3'30 million dollars. accordance with the new Act. the Censius, & 9urn au of .oreir-n & Dome: ~ Bic Cor,,Vee. preliminary estimates and TIculd pr-obabl. have rc:ltc1 in comrerhat different ,ipply percent:. es. Footnotes for table 11 continued from page 29. 2/ Shipments are to Alascia, Hawaii, Puerto Rico ?rnd Virgin Islands. does not include any adjustmiit for trends or unusual conditions. 4/ Less than 500,000 bushels. 5/ Some new wheat included, 1930-36. Beginning 1937, only old crop wheat is shown. 6/ Preliminary. .timasupport price percentage based on table 12.
: Deep not..take into account transitional parity price . level may be undertaken when necessary in the national interest. i .l %snes are in effect. This is not taken into consideration in the "
i b, oause ireso doing it would necessitate adjustment in supplies ,. U G llImVIA m ..
: bu bu. bu. bu. bu. bu. Farm :7.0 14.0 12.0 6.8 5.4 2.2 2,7 . Interior mills and elevators: 9.3 10.4 6.0 1.1 .1.3 0.3 0.6 '. Total supply :66.3 76.1 62.0 7.7 42.6 41.
uses .9.1 22.3 2.3 10.8 11.9 -6.3 .2. 7. Total domestic : 30.9 48.3 463 38.0 36.5 29.2 89. Stocks, June 30 : 34.3 26 14.3 8.1 .
: .':. : :':" .=. ... ..